After a traumatic break-up from her boyfriend, Rhona Hartley found herself facing another loss which was just as devastating – that of her hair. Following a visit to a doctor she was told she had alopecia areata – a condition that causes round bald patches which may come and go. She was prescribed a steroid lotion and after about nine months her hair had grown back. For 21 years, the mum-of-two suffered no further problems until the wife of a close friend died of leukaemia, leaving behind three children. “The grief and devastation I felt following her death was similar to the emotions I had experienced all those years ago when I split from my boyfriend,” says Rhona, 50, from North Berwick. “As a result, I lost a patch of hair at the front of my head.” Once again her hair grew back, but this time the recovery was short term and two years ago a patch of hair above her right ear fell out. Rhona, director of Brand-it Scotland, which provides branded products for companies, had fallen out with a close friend and within a year she lost 80 per cent of her hair. “I tend to take things to heart and this is how it manifests itself,” she says. When her hair grew back, it came in white, leaving her “looking like Cruella de Vil from 101 Dalmatians”. “I have got a little nine-year-old daughter. Somebody asked my wee daughter ‘Is that your gran?’ I know I'm 50 and I could be her gran, but that really hurt me.” The new white hair eventually fell out in the summer and Rhona had decided it was now time to take action. She had tried wigs but found them uncomfortable. “I really hated them," she says. “The wig was hot and itchy and it looked like a wig. There was always the tension of catching it on someone’s jewellery and the whole thing coming off." Having spoken to a neighbour who also suffered from alopecia, Rhona found out about a hair replacement system using natural hair woven through a mesh. She visited the same salon as her neighbour – the Lucinda Ellery hair loss consultancy in London – and after talking through all her options, she was fitted with an intralace system. The procedure, which took eight hours, involved threading what was left of her hair through a mesh and then attaching it to real hair wefts, with a result Rhona describes as miraculous. It is certainly not an option for everyone – costing between £800 and £1900 – but Rhona believes it was money well spent. Her new hair will last for two years, during which time she will need to return to the salon for six-weekly visits to have the system adjusted as her own hair grows back. But when that happens, she will no longer have to travel 400 miles to get her hair done as Lucinda Ellery has just opened a new studio in Dundas Street in Edinburgh. Dubbed the Hair Fairy, Lucinda has treated everyone from celebrities to cancer patients and children suffering from a condition that drives them to pull their hair out. She lost her own blonde locks at the age of nine, following the death of her father and the consequential break-up of her family. Nearly half a century later, she has salons in London, Los Angeles, Manchester and now Edinburgh, after opening her Capital branch last month. The grandmother-of-six, who grudgingly admits to being in her late 50s, is a showcase for her work, sporting long, straight blonde hair. In reality, she says it’s “a short, black ball of frizz.” For Lucinda, her work is part hairdressing, part therapy, and her salons are luxurious havens for women – suffering anything from a bad hair day to serious hair loss – desperate to regain some type of normality in their lives. The finishing touches are still being added to the Edinburgh studio, which is decorated in neutral tones and furnished with sofas, scented candles, huge vases of flowers, photo frames and ornaments. After losing her hair, Lucinda wore wigs for 23 years and was the proud owner of 127 at the last count. “I love wigs but they are quite restrictive,” she says. “I slept in them and no-one ever saw me without them.” She would suffer feelings of panic when she was changing her wigs or if anyone looked at her hair too closely. “Everyone knows what a bad hair day is like, but a bad hair life is completely different,” she says. From childhood, her dream was to create perfect hair, but with several marriages and three children under her belt, she found herself working in a series of jobs in bars, restaurants and a recruitment agency, to pay the bills. She started researching hair loss and thinning hair in women in 1984 after being amazed by Daryl Hannah’s hair extensions in the film Splash. Since then she has worked with numerous big names, including Cheryl Cole, Peaches Geldof and Rachel Hunter – most of whom come to her for hair extensions in order to achieve the “big hair” look. However, it was the distressing condition known as trichotillomania (TTM), where the sufferer is driven to pull out their hair, that first led her to develop her intralace system. This allows the client’s existing hair to be threaded through a breathable mesh before being attached to extensions containing additional human hair. 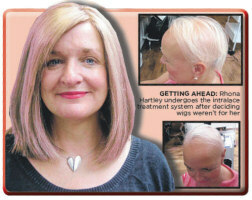 Once in place, the hair can be treated as normal hair and can be washed, styled, cut and coloured. An added bonus is that the natural hair continues to grow underneath. As well as helping people with TTM, she works with girls and women who have alopecia, cancer or scarring from burns, wounds and other injuries. While clients are allowed to choose their new look, Lucinda always advises them to be cautious. “I like clients to choose the designs themselves,” she says. “They get a shoebox and put pictures in from magazines and newspapers. I also like to work with images of them at their best”. “I like to evolve slowly but surely back into a decent head of hair. Very few women want to look entirely different. Most girls want to look the same but with just a bit more.” For Lucinda, the biggest plus of her intralace system is being able to put her hair up in a ponytail.